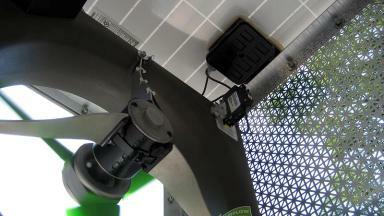 Direct drive of a cooling fan is a great application for solar photovoltaic power. The more intense the sun, the more air the fan moves. 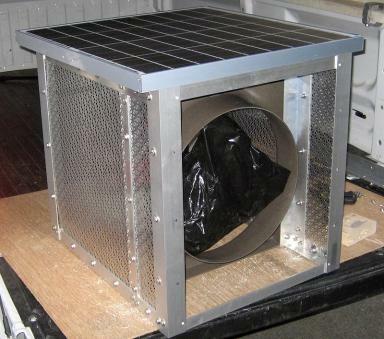 Below is video of the fan in operation. What appears to be erratic rotation of the fan is a video artifact. In reality, the fan turns smoothly with its speed in direct proportion to sunlight intensity. 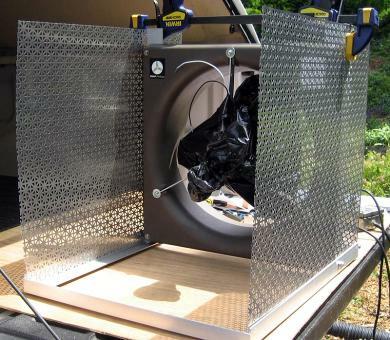 Scroll down for pictures of one of the solar fan units being built for use at Black Bear Days 2012. 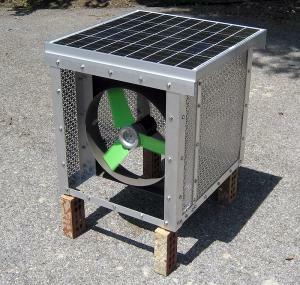 A 16 inch DC fan by SnapFan is used as the basis for the unit. 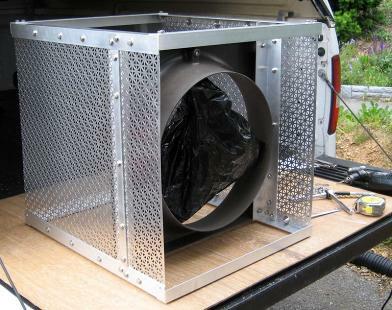 It is normally used as an attic or greenhouse fan mounted in the gable end of a building. Frame almost completed and ready for the solar module. Kyocera 50 Watt solar PV module attached. Interior view while running. DC circuit breaker is for safety, and as a means to disable the fan. Fully self-contained with no wires running in or out. Just add sunlight. The more intense the sun, the more cooling air is moved. All Video is in 1080p High Definition. Once you start the video playing, you can use the resolution selection (where it shows "360p" in the lower right corner) to switch to HD. Use the "Four Arrow" icon next to it to expand to full-screen viewing.